Oak Park Records has what you’re looking for on Record Store Day — or any other day, for that matter. As it approaches its tenth anniversary in the suburban-Chicago hometown of Ernest Hemingway, Betty White, and Dan Castellaneta, Oak Park Records continues to surprise me, because even though I’ve been buying albums since I was 11 years old, it took 23 more years, not to mention the birthday gift of a USB turntable in 2009, for me to start buying records, i.e., vinyl, on a semi-regular basis. I don’t know how he does it, but the store’s owner, Alan Heffelfinger, can read my mind, so when I went in looking for Paul Simon’s long-out-of-print Greatest Hits, Etc. (1977) two years ago, Oak Park Records had it. The same was true for Harvey Mason’s Dancing in the Street (1975), Manchild‘s Feel the Phuff (1978), and both of Albert Brooks’s comedy albums, including A Star Is Bought (1975), which has never been issued on CD. I was also more than happy to hand over a few dollars for unknown quantities such as Barbara Mason and Bunny Sigler‘s Locked in This Position (1977) and Kasim, the 1982 solo album from Utopia‘s Kasim Sulton. Who needs Google drones when the Chicago area has Alan? It also doesn’t hurt that the packaging on almost any LP you buy at Oak Park Records is in tip-top condition, while Alan’s two grade-school-age daughters add plenty of charm to the surroundings just by doing their homework in the back corner of the store and selling Christmas decorations made out of pipe cleaners at the checkout counter. On Saturday, April 19, Oak Park Records will be celebrating Record Store Day by opening one hour early, at 10 AM, and offering special prices on all its merchandise (excluding RSD-only releases): 20 percent off CDs, DVDs, and used LPs; 10 percent off new LPs; 75 percent off 45 singles; and 75 cents for CDs normally priced at $1.99. Late last year I e-mailed Alan a few questions about his store, and he was kind enough to respond. Before opening Oak Park Records in November 2004, you worked for Capitol Records, correct? What was your job at that label, and where were you based? I worked in the mail room for EMI Music Distribution for a little less than three years out in Arlington Heights, right behind the Daily Herald. While working as a manager at a couple different Sam Goody locations I got to know the reps that came into the stores from all the different record labels. When a position at EMI opened up, their rep informed me and also put in a recommendation. I quickly figured out I had no desire to move up the ranks and out of the mail room. 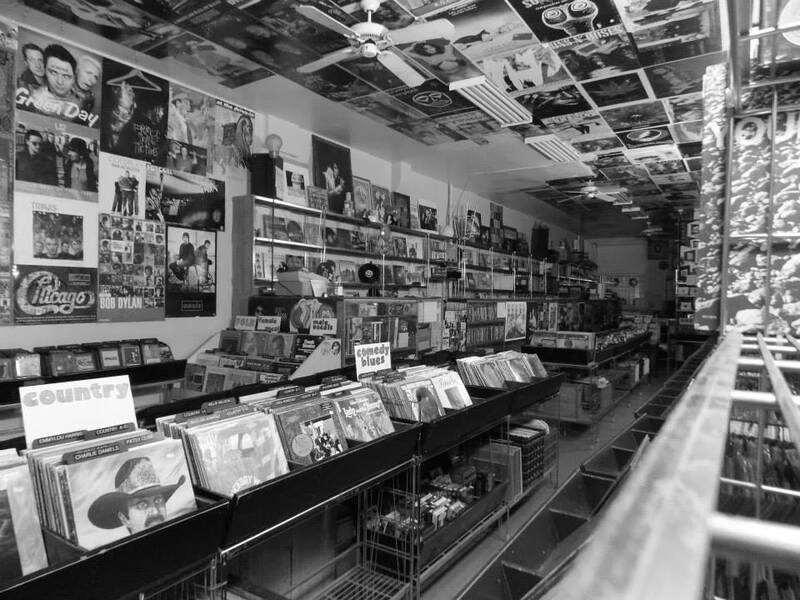 Had you owned and operated a record store of your own before ’04? Was it always a long-term goal of yours or just a natural progression from being on the other side of the distribution fence, so to speak, at Capitol? I had my experience of running a music store during my Sam Goody days, but running Oak Park Records seems like a completely different type of business. I actually stood inside this store back in the mid-’90s with my then girlfriend and said I wanted to own a music store like this one day. Twenty years later I own the store and have been married to that girlfriend for 17 years. After a couple decades of declining sales, vinyl LPs began to make a small but noticeable comeback starting in 2005. Did you anticipate this resurgence, or was it more a matter of “right place, right time”? Without a doubt, right-place, right-time situation. It was not a smart move in 2004 to buy an independent music store, but I was chasing my dream. Luckily enough, things have continued to roll the right way for almost a decade now. Because of vinyl’s renewed popularity, do you often have kids and their parents coming into the store together to shop for records? Or do you see the parents flipping through the CDs while the kids check out the vinyl? I do get a kick out of parent/kid record-store customers. Usually it will be the parent giving tons of recommendations to the younger vinyl buyer. Sometimes the kids put the recommendations in their pile, and other times they’ll get a smirk on their face or just shake their head. Neither. I’ve never spent a lot of time thinking about Amazon; I don’t use it. Not because I’m against it — I just don’t need their services. My wife, on the other hand, uses Amazon for a lot of things. I understand why it’s very popular and useful, but I can’t concern myself with that big of a fish in the music-retail sea. All I can do is keep my customers happy and have them want to continue coming back to Oak Park Records. Are there any records in the store that you’re shocked no one’s bought in the past nine years? Or one that will set off confetti cannons behind the counter if someone actually does buy it? There are a couple records in the store that I haven’t budged on the price over the years. When I feel there’s no chance of it ever selling I’ll either bring it home for my collection or put it up on eBay. I used to sell a lot more on eBay, but with the resurgence of vinyl it’s become easier to move higher-priced LPs. What do you think the music-retail landscape will look like in five years? And do you think compact discs will ever enjoy the kind of comeback that vinyl has had? I don’t see that much change for music retail in the near future. There will never be a rush to put music stores back into malls, but plenty of smaller, independent stores will continue to rise. A lot of cool and hip stores have begun to sell new vinyl. It’s being stocked for the “cool” factor, not with hopes of people coming to the store because of it. A lot of these stores that stock new vinyl also have it marked so expensive it’s laughable. You never know if CDs will make a comeback like vinyl did; I would put my money down on “no,” but I would’ve also put my money on “no” for a vinyl resurgence. I’m just happy there’s been a music-store resurgence. I don’t care if I make money by selling VHS tapes or cassettes as long as people are continuing to come back to music shops. Oak Park Records is located at 179 S. Oak Park Ave., one block south of the Oak Park stop on the CTA Green Line. Call ahead at 708-524-2880 or check out Alan’s most recent updates on Facebook.